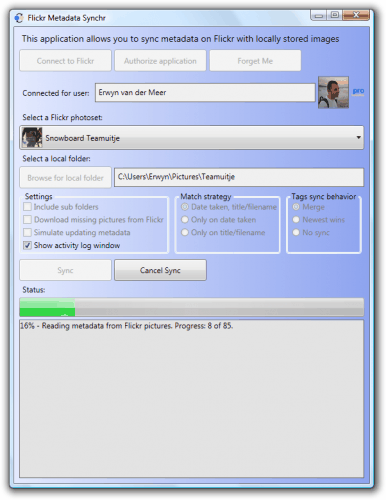 Flickr Metadata Synchr provides an easy way to keep the metadata of local images and the images that have been uploaded to Flickr in sync. The software can check if a local version of the image is existing and if it is not existing download it from Flickr to have a local copy of every image that has been uploaded to Flickr on the computer. Flickr is using several metadata information like the image title, description, tags, author and gps location. All of these parameters can be synced with the tool. The process is always the same. The software extracts the metadata from Flickr and from the XMP and IPTC sections of locally stored images. Pictures are then matched into pairs by using filename, title and date / time information. Pictures that do not exist locally can be downloaded from Flickr. The metadata is merged from both sides. Blank fields will be synchronized with metadata from a side that has information about that field. If both the local and online copy of the image contain metadata for a specific field the last updated stamp will determine which information will be used for both images. Tags can be configured to be merged completely which would essentially mean that all tags from both sides will be considered and added to both sides, that the newer tags will be used or that tags will be left unchanged. Flickr Metadata Synchr comes with a simulation mode which simulates the changes but does not actually commit them which is great to test the waters. Previous Post: « Why Can't I Uninstall the Microsoft .net Framework?